Golden Valley Camp has eleven cabins which each sleep up to twelve campers. The cabins are appropriately clustered and separated to meet your needs for lodging and supervision of mixed gender groups. All of our bunks include a mattress. Since we all have different preferences for bedding, we allow you to provide your own sleeping bags and pillows. Meadowview Camp has four cabins named for birds native to our beautiful Sierra Nevada Foothills: Finch, Robin, Quail and Wren. In addition to the four cabins Meadowview Camp is also serviced by a central bathhouse with 3 showers and 3 bathroom stalls. Each cabin in Meadowview Camp sleeps twelve in double bunks. Our rustic Wilderness Camp also has four cabins that sleep twelve each. These cabins are named for local tree species: Cedar, Pine, Oak and Madrone. Wilderness Camp is also has its own dedicated bathhouse with 2 showers and 2 bathroom stalls. Our final cabins are located in the central camp area. These three cabins sleep between 4 and 8 people. The Miner's Cabin and Creek Cabin both sleep 4 while the Barrett Cabin can sleep up to 6. 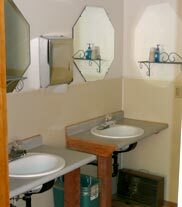 The three cabins use our central camp bathhouse which has male and female restrooms. Each restroom has 3 bathroom stalls and 3 showers. Have questions about which cabins are right for you? Let a member of our staff know and we will be happy to assist you in selecting the cabins that will be the right fit for your group.